That they might well never meet again in this disordered world. To say what he really thinks of his dear friend’s vast output of poetry. Land visible among the wisps of mist. A flood of water pours from a cleft. A tree leans out drunkenly from a rock-face. The poetess falls off her seat, thoroughly pissed. Kuppner, who is also a novelist, brings his narrative skill to the handling of The Third Mandarin. While the book sets out to undermine those in thrall to the mystical East who are in search of wisdom and profundity by sticking ‘faithfully to the path of least significance’, it is still held together by a number of recurring stories, plots and ideas. Many of the quatrains give us different viewpoints or interpretations on a set event, while others are almost metatextual, giving us endless alternative lines and rhymes for the poem in question. The two major underlying strands are the mysterious ‘Third Mandarin’ – who features in song throughout the book but only really materialises in the fifth section – and the whereabouts of the ever-elusive ‘Aunt, the retired Imperial Concubine, Swaying Blossom’. A relative of Swaying Blossom makes the pilgrimage to her ‘Hillside Retreat’ each year on her birthday and, ‘alas!’ finds her absent each time. Many years pass as the book moves on and it is only in the penultimate quatrain, the punchline payoff of The Third Mandarin, that we are given the denouement as to why she is avoiding her relative. That two soldiers are lying dead in the surrounding undergrowth. With a loud cry of ‘What are we waiting for!’ – off they all go at speed. With insufficient energy left to shout for help. He might well have starved to death. Which, in fact, he does anyway. The need to add at least a small conjectural footnote or two. 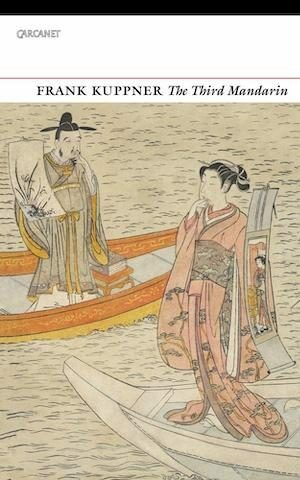 The Third Mandarin by Frank Kuppner is published by Carcanet, 2018. Richie McCaffery is a poet and writer. He was a Hawthornden fellow in October 2011, was the recipient of a 2009 Edwin Morgan Travel Bursary, and has been twice shortlisted for a Scottish Book Trust New Writer’s Award and twice for the Eric Gregory Awards.